Did you recently notice a change in your rankings of the local search results for your business or company? If so, you were not alone, as everyone was affected by the latest major algorithm update by Google, known as Google Possum. On September 1, 2016, Google released a new algorithm that updated and impacted the Local Search results for Google Maps, Google Places and the Map Pack, or as the SEO Community calls it, the “3-Pack” for the three listings that appear on the search results page within Google Maps. Possum is an algorithm update for Google’s Local Search results that are being considered in the SEO Community is the largest update since Google rolled out Pigeon in 2014. This update focuses specifically on providing more accurate local search results based on five “known” factors that have been discovered since the update rollout, which is explained in this blog post. Why Did Google Update with Possum? To those that were ranking high before Google rolled out the Possum Update, they may be questioning why Google updated their Local Search algorithm. Yet, Google always has its reasonings. This is because the new algorithm is supposed to provide a level playing field for all the local businesses listed in these Local Search results, like Google Maps. At the same time, this means Local SEO is going to become more competitive. Before the update occurred, it was extremely difficult for businesses that were located outside city limits to appear in the Local Search results. Before the update occurred, it was extremely difficult for businesses that were located outside city limits to appear in the Local Search results, even with paid listings through Google AdWords or having fully optimized accounts and websites that included the city name as well. Before the update occurred, it was extremely difficult for businesses that were located outside city limits to appear in the Local Search results, even with paid listings through Google AdWords or having fully optimized accounts and websites that included the city name as well. This hurt many local businesses that did business in major cities with surrounding suburbs around the country, but was not physically located within the city limits or perimeter as outlined on Google Maps and ranked them significantly lower because of these factors. Therefore, with the new algorithm, Google has created new ‘filters’ and that’s why this update is called Possum since listings that use to rank high have now been filtered out or “playing possum” with keywords. After a few months of research, testing and industry discussion among the SEO Community these are the 5 “Known” Changes from the Google Possum Update that is impacting Local SEO, along with some believing that these changes to the algorithm are not only impacting the Google Maps, but also organic search results as well, which we will discuss as well. It has been determined that the actual physical location of the user when the search is conducted will return different search results. Even a small change in the user location has been providing a slight variation in the search results for that user with the same exact search query. It is believed that for mobile devices, it is more than likely based on the users GPS location and for desktop devices, it is based on the IP address location. Throughout the SEO Community, it has been determined with this Possum Update, that the further the distance your business is located from the physical location of the searcher, the lower the rankings of that business will be in the search results. Yet, this update is just incorporating the SEO strategies that Local SEO has been implementing since the Pigeon 2014 update of optimizing for the “near me” searches which these types of “near me” searches having doubled since that time to provide more relevant results to the user. Google is merely updating their algorithm based on the types of searches being conducted by users, as well as the trends in the industry showing that 56% of searches are being conducted on mobile devices and are expected to increase with the continuous adaptation of smart devices. With Possum, even the order of the keywords used in the search has become more important, since they are returning different results, especially in the Map Pack, based on the search query being used by the user. 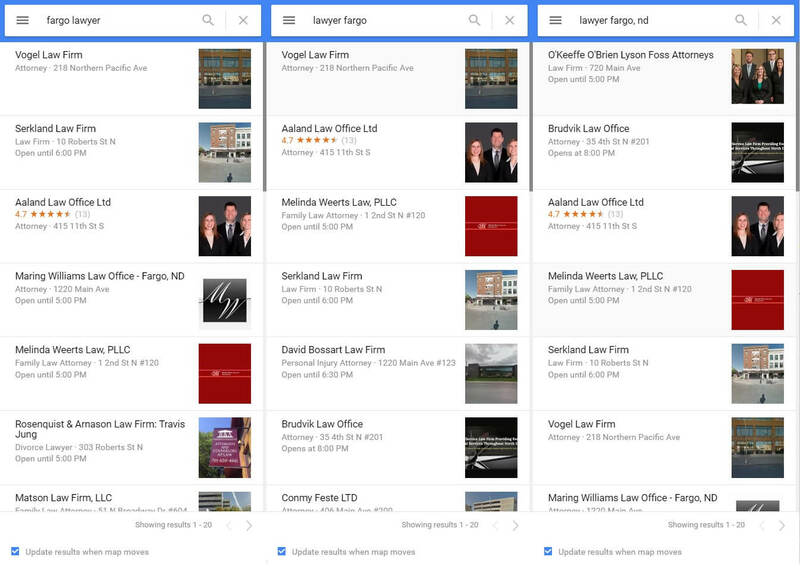 Take for example a search query of “Fargo Lawyer”, “Lawyer Fargo”, and “Lawyer Fargo, ND” would have previously delivered the same exact results, without changing the order of the listings based on a properly SEO optimized account and website for a particular variation of that search term. However, it appears that there are differences occurring in the search results between these similar types of keywords now as compared to before. This develops an interesting scenario as it’s going to create the need for more iterations of keywords on websites to be ranked for all these different types of keyword variations. Along with the fact that this seems to turn ‘exact match’ keywords into functioning more like ‘phrase match’ keywords instead, making Local SEO even more competitive now between companies and businesses. What you get with a ‘level’ playing field is more competition. Before Possum, the local algorithm would ‘filter’ out listings that shared a domain name (website address) or a phone number. However, with the Possum Update a new ‘filter’ has been applied to the algorithm to include addresses now, or essentially similar and shared addresses. This may not seem like a significant filter, but it has major implications for companies that were manipulating the system to have multiple listings in the results. This should eliminate ‘fake’ office locations that were set up just to get listed in the results (interestingly, some of these companies were doing this to just get listed for that city in the search results, due to Google’s previous city limits parameters they were not able to get listed, as explained and discussed on the next point). The companies that weren’t manipulating the system but have shared office space, or business practices like law firms, dentists, doctors and that all operate out of the same address will no longer be listed together anymore. Instead, they will be listed only once now. This may seem like a ‘penalty’ to those businesses but Google wants to provide the most relevant and variety for their users in the search results. Because, let’s be honest here. It may be great for that business to fill all the listings from a non-branded search, but as a user you want variety and options to make a decision. Google is just trying to provide the best results for the user. As that’s the service Google is providing for their business. It has been discovered that, if the businesses have been ‘filtered’ by the Possum Update because of the same address affiliation, that zooming out or in on the map in Google Maps will change the search results and display the same company. Google provides this feature and option to the user on the bottom of all their search results in google maps. However, that is assuming and relying on the user to zoom in or out on the map and not just solely relying on the results that Google provided them in their initial search. At least there is hope knowing that these types of businesses aren’t completely filtered out by Google altogether. Just makes it more difficult to be discovered on the initial “3-Pack” results, like it was before. Yet, users adapt to Google’s changes rather quickly and this small change may seem big now, it may not have such a lasting impact over time as users learn the small interface changes of Google Maps. This may be considered the biggest impact of the Possum Update for all businesses and business listings! As mentioned earlier the businesses that were located outside of the city limits on Google Maps, have now seen an increase in their ranking, with some of these businesses even going from ‘ranking purgatory’ to being one of the top three listings, based on the keyword variations being used, as discussed above with #2 on Keyword Variation Changes. The reason this is considered the biggest impact from the Possum Update for all businesses and business listings is that this will impact every major metropolitan areas with suburbs that are still considered ‘part’ of that metropolitan city. So before Possum, if a company was located right outside the city limits, but most of its business came from within the city, Google Maps or the “Map Packs” would not display these businesses for the user even if the user and search came right across the street from that business. It was all determined by the city limits in Google Maps. Take for example the Fargo, Moorhead and West Fargo metropolitan area (FMWF). 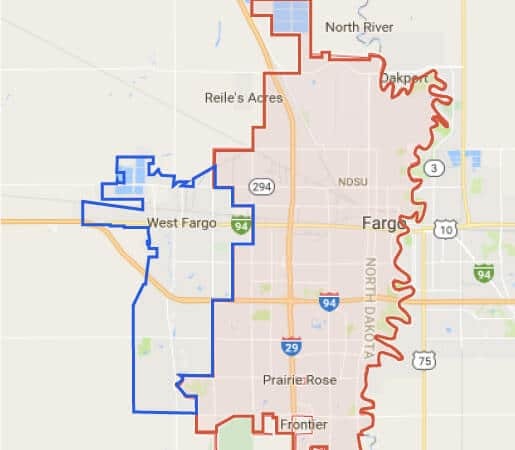 For Fargo, ND and West Fargo, ND the city limit lines for both cities are almost right down the primary commercial area (businesses, retail, restaurants, etc.) for almost the entire metro area. Previously if a user would include a city name of Fargo or West Fargo in their search Google wouldn’t list businesses that weren’t located within those city limits, but those businesses could literally be right across the street from the city limits. This was creating a serious disadvantage for those businesses on Google Maps. Since, Google based their previous local algorithm filter off the simple fact or conclusion, that if a business does not exist within the city limits it was irrelevant to the user. So, based on this belief Google determined if the user included a city in their search (i.e. Restaurant Fargo, ND) that the user only wanted businesses within that city and its city limits. But Google did not realize that the user’s search ‘intent’ was to just narrow down their search results, specific to their location or based on the “near me” searches as mentioned earlier. But the user still wants to have all the businesses and services available offered to them, so they can compare and consider ALL their options available, based on their search terms. Thus if someone was in the major business area of Fargo and West Fargo. 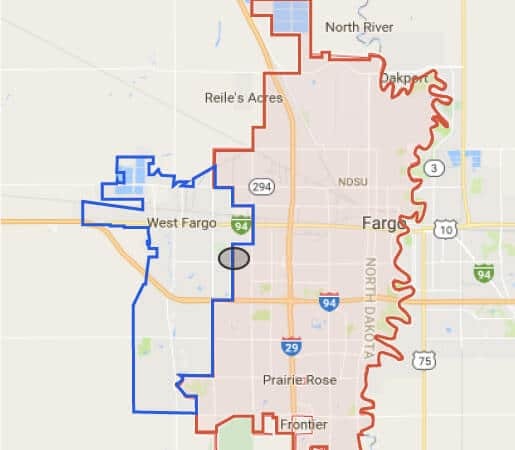 Where, as explained above, the city limits are almost down the center of the primary commercial area, and that user searched for “Restaurants Fargo” as their search term, they would not receive search results listings for restaurants in West Fargo, ND. Especially in the “3 Pack” listings on Google maps. This would be the case even for the West Fargo, ND restaurants that literally could have been right across the street from where that user searched for restaurants in Fargo. Now with the Possum Update, it appears that these issues have been fixed, with the city limits not having an impact on the search terms, but instead the search terms being weighted more by the relevance to the user’s location and their search query. This small change could have big ramifications for businesses that have been ‘left out’ from the search listings and essentially in ‘search purgatory’ all because of their physical business location and not based on having their website and Google Business Listing SEO optimized properly for being ranked and listed accordingly. This is a major and beneficial change for everyone. As mentioned in the beginning of this posting. It is believed that there are two different local search algorithms operating now from the Possum Update. One is for Local Map (Google Maps) results and the other is for the organic listings (Google.com). The reason this is believed is that in the past if the domain (website) that you linked to in your Google My Business listing was excluded from the organic listings and it would have a negative impact on your listing and ranking for the Local Map three pack. his was because Google treated these listings and sites as ‘duplicate’ content which happened to a majority of companies that run their own practices, like doctors, lawyers, insurance agents, accountants and more. But since the Possum Update, this does not seem to be happening anymore and many local businesses are starting to experience positive gains in their rankings. However, because of this change, the local market is going to be facing some serious competition for rankings now. It is important to remember that even though Google released this new update to the local algorithm, Google is constantly testing and tweaking algorithms all the time. There is really no way to know what Google has released except with diligent tracking of all SEO factors and following anything in the industry that may have changed. Google keeps evolving its algorithms in correlation with the behavior of its users based on the search trends and wants to provide the best service to its customers that are using their service. The search results are determined based on the actual location of the user when the search was conducted. Google now allows companies that are outside the city limits but conducts business in the nearby or ‘neighboring’ city to be listed in the map pack search results now. It is believed that there are two different local search algorithms operating now from the Possum Update. One is for Local Map (Google Maps) results and the other is for the organic listings (Google.com). These are the known changes from the Google Possum Update, and the SEO community is still reviewing data to determine if anything else in Local SEO has been affected or impacted at all. If so, we will keep you posted if anything new is discovered! Contact us to learn more about Possum and how your website could benefit from professional SEO services after Google’s major algorithm update.